For the most current information about this outbreak, including the most up to date number of cases, see WHO’s Ebola situation reports: Democratic Republic of the Congo. 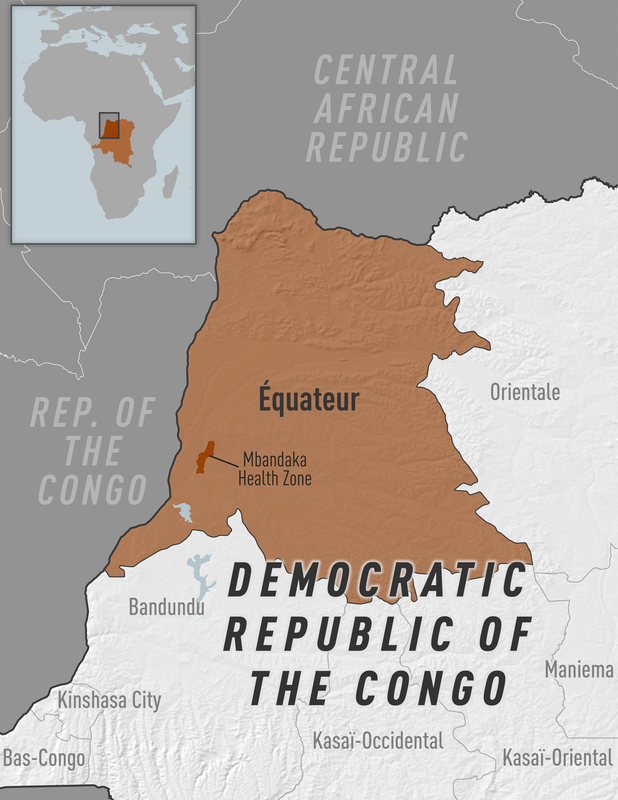 On August 1, 2018, the Ministry of Health of the Democratic Republic of Congo reported an outbreak of Ebola virus disease in North Kivu Province. The outbreak is continuing with moderate intensity in Eastern DRC. Confirmed and probable cases have been reported in twenty-one health zones of North Kivu and Ituri provinces (Beni, Biena, Butembo, Kalunguta, Katwa, Kayina, Kyondo, Lubero, Mabalako, Mangurujipa, Masereka, Musienene, Mutwanga, Oicha, and Vuhovi zones in North Kivu; as well as Bunia, Komanda, Mandima, Nyakunde, Rwampara, and Tchomia zones in Ituri). The area is about 780 miles away from Equateur province, where an Ebola outbreak was reported in May 2018. Although the ebolavirus species associated with the current outbreak is the same species that caused the earlier outbreak (Zaire ebolavirus), genetic differences between the viruses suggest the two outbreaks are not linked. This is the 10th Ebola outbreak in DRC since the virus was discovered in 1976 in DRC. The Centers for Disease Control and Prevention (CDC) is assisting the DRC government, countries bordering the outbreak area, and local and international partners such as the World Health Organization (WHO) to coordinate activities and provide technical guidance related to surveillance, laboratory testing, contact tracing, infection control, border health screening, data management, risk communication and health education, vaccination, and logistics. CDC experts are supporting partners by providing technical assistance and expertise in the Democratic Republic of Congo and surrounding countries, at the World Health Organization in Geneva, and at CDC headquarters in Atlanta. Learn more about what they are doing.